You can filter your schedule on texts, icon, date ranges and colors. 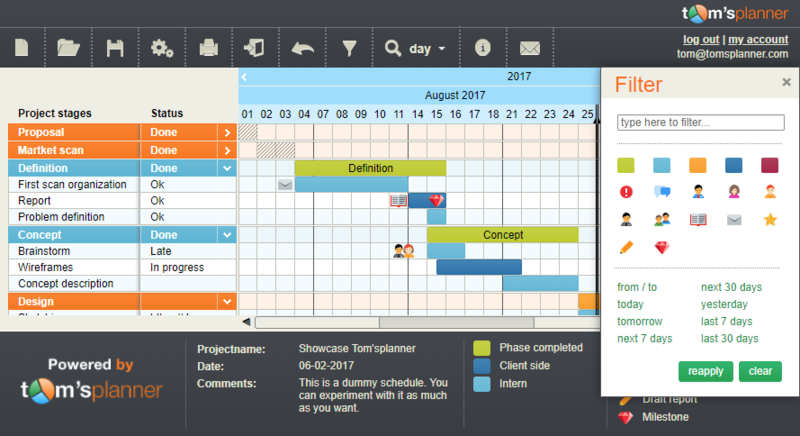 You can start filtering your Gantt chart by clicking on the ‘filter / search’ button in the top toolbar. When you make changes to the chart (for instance change the color of a time block) you will always be able to see the changes you made (even if they don’t comply with the filter). To reapply a filter click on the reapply button in the filter panel or on the refresh icon in the filter summary in the title bar of the tool. Looking for something specific in your schedule? Just enter a text fragment (like for instance the last name of a resource) in the filter panel and only the related items in the chart will be shown.